As a quick mention before starting the article, this very same article was originally posted on my new blog site, the Rhysins Record. This will be my new home for posting online articles when my time with Wicid comes to an end this year on June 21st, so make sure to keep up to date with them there or via my Twitter. Recently I got the chance to see one of the first live shows of the ITV professional wrestling series, WOS Wrestling, as they appeared at the Newport Centre in, well, Newport. This was their second show of the six they had running for their first tour. The first was in Southampton (18th January), and other shows being later in January and February, the actual dates are at the end of this review should anyone want to know more. The venue itself felt like a small throw back for me personally since the Newport Centre is where I took my first ever professional wrestling classes, and despite being on and off training for many years due to University studies and physical and mental health problems, I’m properly getting back into it with the same place. I’m starting to slowly but surely get myself into a better mind frame of what I need to do to improve myself. I’ll likely start talking about stuff like that more at some point. The turn out was very family oriented which made sense with WOS Wrestling being aimed at a very family-friendly audience at Saturday afternoons during the run of it’s first season on TV. However, it was a nice mixture of kids and their parents as well as a few young adult stragglers, as you’d expect at other independent shows. The main thing that stood out to me from the whole night was the production set-up of the show. Even thought it was basically held in a Sports Centre, you really couldn’t tell that walking in. The lighting set up around the ring, the entrance ramp with projectors, the sound system, everything was put together very well, and for that, I really did enjoy the show that much more. And with none of the jarring camera angles that you saw during the television show, which makes sense since, you know, it was live and not pre-recorded. The first match saw the overconfident Alpha Bad introduce themselves when ring announcer didn’t do a good enough job to their standards. They fought against the most more loved masked marvel, Robbie X, and the equally marvellous BT Gunn. This went as well as you’d expect, Kip and Iestyn using some tag team shenanigans which distracting the ref to gain advantages, and both Robbie and BT using their speed and agility to pull out some impressive manoeuvres against the former WOS Tag team Champions. In the end it was Robbie X who got the pinfall as they started the night off on a good note for the Newport crowd. Joe Hendry had the entire crowd waving their arms to his entrance music, so to say he was welcomed with open arms would be an understatement. Similar to the last match, you had CJ and Sha cause a commotion with the referee while both of them overpowered the Prestigious One, getting much dislike from the children for their nasty antics. Joe was able to fight back like the hero he is and was close to getting a clean win, however Rampage appeared and attacked Hendry, leading to the three villains overpowering him. 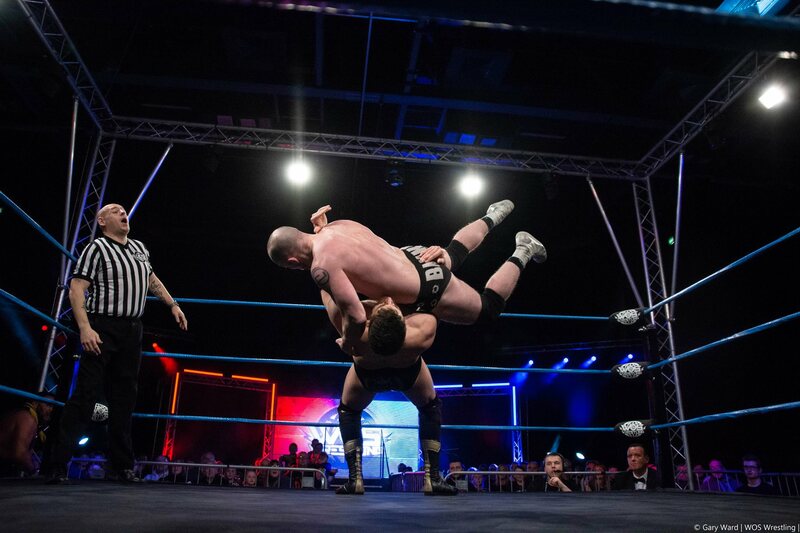 Luckily the courageous theme tune of the WOS Heavyweight Champion Justin Sysum played, and the champion himself appeared to try and even the odds. During this we got a message from WOS Executive Stu Bennett mentioning that while he wasn’t there live, someone else was who would be acting as the WOS Executive for that night, and that would be the female voice of WOS Wrestling, SoCal Val. She reconfirmed that Justin Sysum would be defending his championship later in the night against Rampage like it had been advertised leading up to the show, which Sha Samuels and CJ Banks would be get another chance against Joe Hendry and a partner of Val’s choosing. 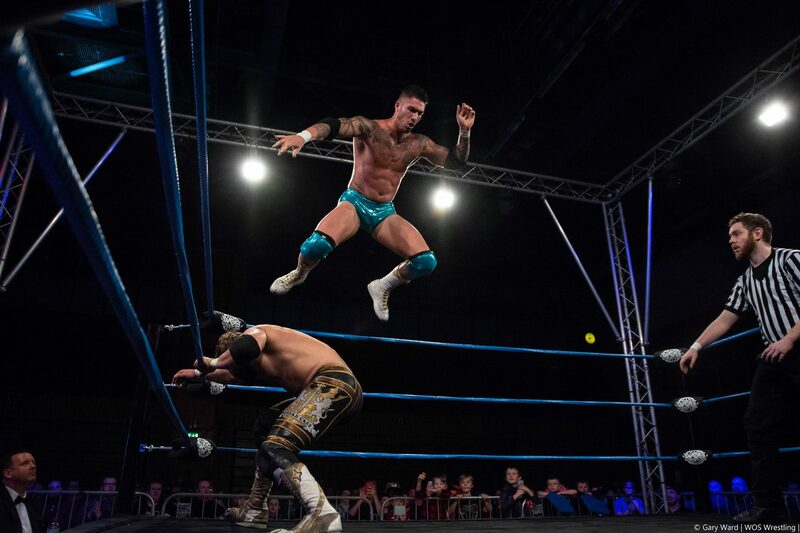 For the people in attendance we got a nice video package highlight the dismastment of the tag team of Nathan Cruz and Adam Maxted and how they are in their current rivalry. Throughout the match the two had more aggression and intensity than the other matches up to this point. Nathan seemed more arrogant in his demeanour than his former tag partner, but the Love Island contestant fought back as much as he could. 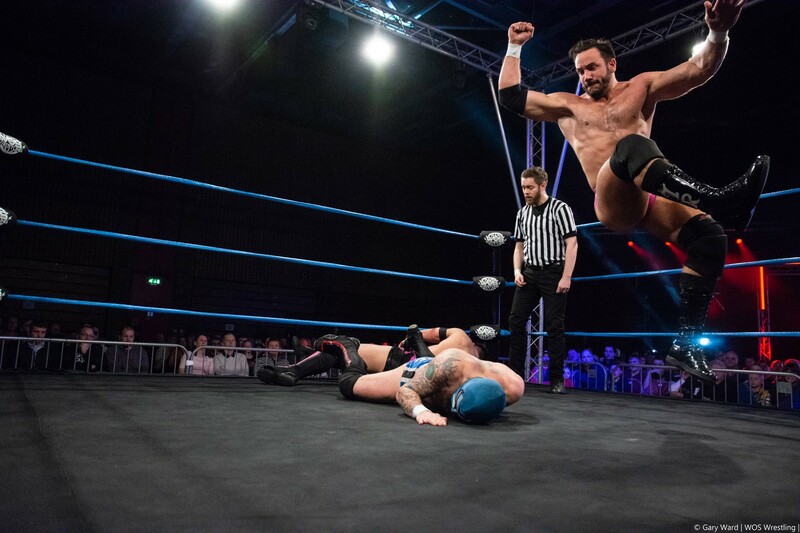 It did come close on many occasions, but the more experienced of the two used his sneaky tactics aka kicking Adam in the manly bits and then hitting a finisher for the pin fall victory to the dissatisfaction on Adam and the Newport crowd. Personally I believed this following match was the match of the night, and what’s even more bizarre is that it was the assigned comedy match of the night. Now we all know Martin Kirby can do comedy to a tea, but Will Ospreay in a comedy match? Don’t see that every day. From the start of the match he seemed to be there for a laugh, trying to get a tongue in check ‘New Japan’ chant going for an insider reference chuckle. While Kirby was a lot more villainous in this match, even in a nastier role, he KNOWS how to do comedy well. The biggest spots of the match came when Will teased for a table, only to say, ‘We don’t have tables’ and instead pulled out a massive orange elastic band. Well shenanigans happened which resulted in Kirby being struck with this band in painfully comical ways. Once with Will hitting him with it, Martin somehow hitting himself with it, and even Will and the ref ‘accidentally’ hitting him with it. 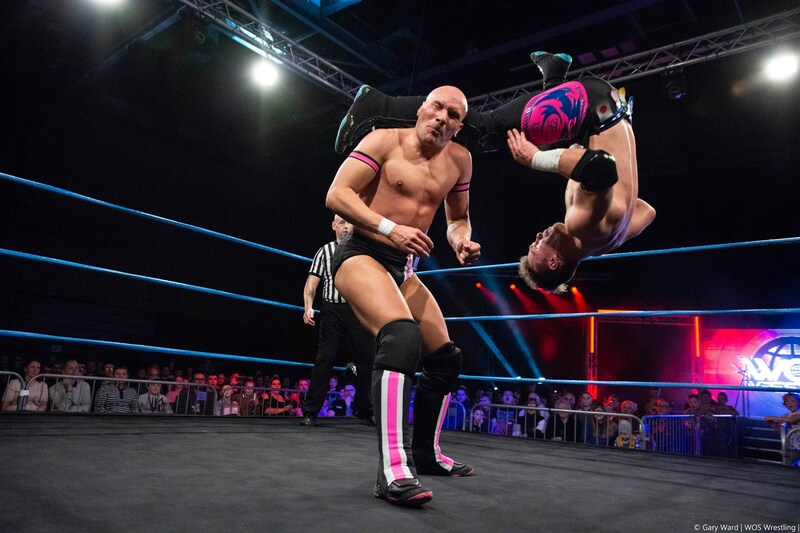 Soon after this tom-foolery, the match picked up to the standard Ospreay match which showcased his other-worldly level of athleticism. Martin Kirby even displayed more athleticism that he wouldn’t normally display which was shocking to most. But really it just showed that the man really can work any style of match with just about anyone. By the end of everything, Ospreay nailed his Storm Breaker finisher for the pin fall victory, which looks even more unbelievable live than on the screen. A very, VERY fun match which led into a brief intermission where people were informed that Adam ‘Flex’ Maxted would be signing pictures near the merchandise tables. Now some small context for the next match, it WAS originally supposed to be Kay Lee Ray defending the WOS Womens Championship against Viper. 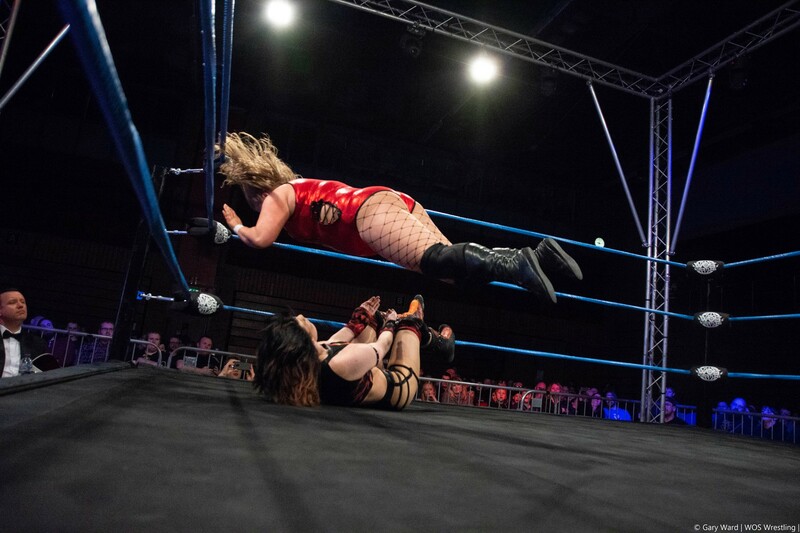 HOWEVER the previous night in Southampton, Kay lee Ray LOST her championship to Viper in a triple threat match also involving Bea Priestley. KLR was then announced as ‘INJURED’ and would not be appearing tonight. Most who watch other places likely saw this as a way to write her off since she made an on-screen appearance with WWE NXT UK, likely signalling her signing with them. But still the new WOS Womens Champions match would take place with the new champion Viper taking on Bea Priestley instead. This was another nice match-up which showcased more of Viper steamrolling over the smaller Priestley and displaying her power. Bea was able to make use of kicks and her quick movements to get the better of the champion of many occasions. And in the second upset of this WOS Tour, Bea rolls up Viper for the shocking three count to become the NEW WOS Womens Champion. Bea rushed off in astonishment as Viper had a mini-tantrum in the ring and stormed off to the back. While it was nice to see a title change on the tour, this was the second one of the same championship belt, which happened the previous night as mentioned. Due to the state of the WOS Womens Division (I’ll get to that later), I feel as though we may be in for an unfortunate hot potato period with the championship, which is very unfortunate. Hopefully I am wrong in thinking that and we see Bea stuck to being the reigning champion for the rest of the tour. It is still nice moments for both women over the past two nights regardless. CJ Banks and Sha Samuels remerged for the second time of the night, as did Hendry to the came reactions as before. As no one came out with Hendry, the two made fun of him for not ‘finding a partner in time’, which seemed a little unnecessary since it WAS pointed out that SoCal would find one herself. But either way this prompted the crowd to chant for one of the centrepieces of WOS, Grado, to which CJ yelled ‘GRADO’S NOT HERE!’ which you should know by now, if the villains say something won’t happen, it always ends up happening. And this was indeed the case as SoCal Val appeared once again to bring out Grado to the delight to everyone in the Newport Centre. Throughout the match CJ and Sha kept ganging up on Hendry as they once did in the singles match, but were much more aggressive as Grado encouraged the crowd to cheer on for the Local hero. 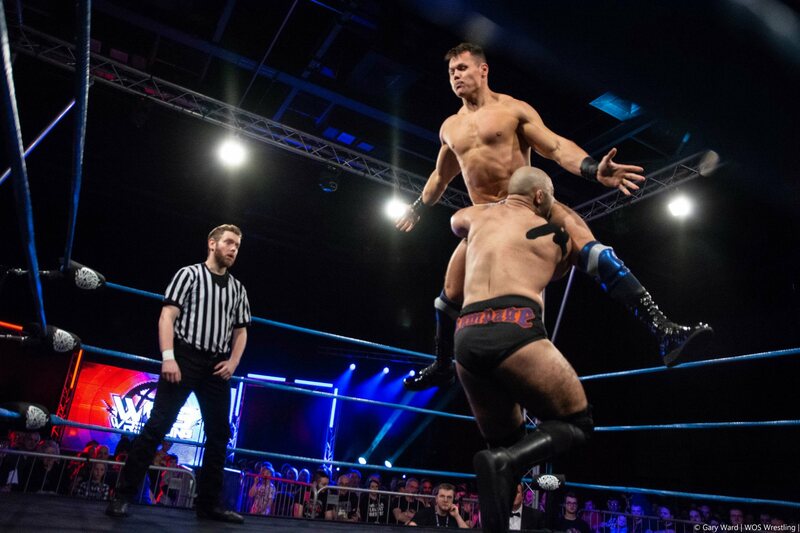 Despite taking a heck of a beating, Joe was able to make enough of a comeback to tag in the hot Grado, who showcased his infectious showman offence against Banks and Samuels. With the help of Joe taking out Banks, Grado hit the Grado Cutter on Samuels for the pin fall victory. With this being the main event of the night, it definitely lived up to the hype throughout the show as this was a very hard hitting bout. Rampage made use of his larger build and edge in strength to beat down on Sysum every chance he got. But the fighting champion had strength of his own mixed with athletic prowess that he used to one up the ruthless challenger. Towards the end of the match while the ref was knocked down, Sha Samuels and CJ Banks appeared again to join Rampage in attacking the champion. Grado and Hendry appeared once again to chase them off. Sysum was able to hit a combination of a corkscrew kick and a 450 Splash from the top rope to get the pin fall victory and retain his championship, closing the show on a happy note as the crowd celebrated alongside the retaining champion. Overall I thoroughly enjoyed watching WOS Wrestling Live, it was very difficult to find any real flaws in the show. The set-up was top notch, the talent all did great, and the crowd was truly into the show from start to finish. If anyone is even remotely interested in seeing any of the other shows going on in this current January/February tour, seriously consider going to one. And despite the shows in Southampton and Newport having very good turnouts, there has been concern over the ticket sales for these January/February 2019 shows as three previous shows in Bournemouth, Aberdeen and Scarborough were cancelled leading into the current year. And even though ITV is showcasing a rerun of the previous season of WOS on Saturday’s again, it is being shown at 12am (technically Sundays), so barely anyone would truly be watching the show. Granted this is so they can show it to go alongside their current tour for the next few weeks, but it is still an unfortunate time slot for them, as has been the case with the first airing of the first season. Despite all the setbacks and concern over the status of the promotion, they appear to be remaining optimistic, hinting at them returning to Newport later in the year’. With this mention, could there still be a future for WOS Wrestling? Will we see new stars appearing to make up for the others being snatched up by larger promotions? Will there be a Season Two? At this point, its anyone’s guess, but if anyone would honestly hope against any of this happening, then you can’t really consider yourself a fan of the profession. So if you want to hope for WOS to live a longer and more prosperous life, then serious consider going to any of their remaining shows in their January/February 2019 tour. There are many links to different ticket providers for the shows, but I will include the dates and locations below again, just in case you did get that at the start. And of course follow them on the social media links below as well.